If you’re planning to begin a course of study in Germany, you must as a rule take out a student insurance policy with one of the statutory health insurance funds. 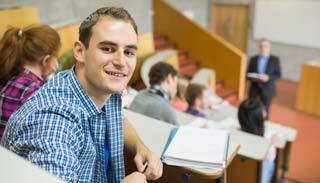 As the official international student office of the DAK - Gesundheit we make it very easy for you: If you are no older than 29 and are beginning a course of study in the first semester at a technical college or university in Germany, you can apply for your student insurance with DAK - Gesundheit directly online here. In addition to the complete statutory insurance cover, with us you enjoy a whole range of special services from the very first day of the semester (see also Description). Make use of the outstanding service we offer: Support for students around the clock, foreign language advice for foreign students, personal contact persons at over 800 service points of the DAK - Gesundheit across Germany. The German Ministry of Health establishes the premium for student health insurance and nursing insurance uniformly and at the same level for all statutory health insurance funds. The premiums are for health insurance €76,07 per month and for nursing insurance €19,79 per month or €21,42 (for persons without children from 23 years of age). You can apply for the student health insurance directly online. Directly you will receive an email containing your provisional certificate of insurance for student health insurance coverage, which is usually recognized upon enrollment. Within four working days you will then receive your final certicate of insurance for student health insurance coverage via email. The certificate will contain your personal health insurance number, which is definitely recognized upon enrollment. Here you can effect the statutory health insurance.